Wednesday 28 November … Like an orchestra in rehearsal, hard and soft corals on Moore Reef off the coast of Cairns, Queensland slowly began releasing eggs and sperm last night ahead of what marine biologists forecast will be a mass coral spawning event on the Great Barrier Reef tomorrow night (Thursday November 29th AEST). While Marine biologists Stuart Ireland from Calypso Productions, Gareth Phillips from Reef Teach and Pablo Cogollos from Sunlover Reef Cruises were based at Sunlover Moore Reef pontoon, 47 km off the coast of Cairns to film the event for marine enthusiasts around the world, a group of leading coral scientists prepared to deploy the most ambitious coral reseeding project ever undertaken. Led by Professor Peter Harrison, the man who first discovered coral spawning in 1982, the team will harvest millions of coral eggs and sperm to grow new coral Larvae which will be released back onto damaged reefs in the Vlasoff and Arlington Reef area off Cairns. The process is described as “IVF for the Reef”. Both scientific parties agree that a successful spawning event is proof that the Reef is resilient and has potential to recover from the back-to-back bleaching events of 2016 and 2017. Mr Ireland said, “Good spawning is important. It shows the plumbing is working and it means the reef is alive. Coral spawning brings genetic variability, strength and resilience to the reef and is a powerful symbol of ongoing life on the Great Barrier Reef." 2018 marks the 22nd time that Mr Ireland has captured spawning on the Great Barrier Reef. This year is the seventh time he will document the event from Sunlover's Moore Reef pontoon, which is favoured for its wide variety of adjacent corals as well as the practicalities of offering a stable base to light the Reef for filming. 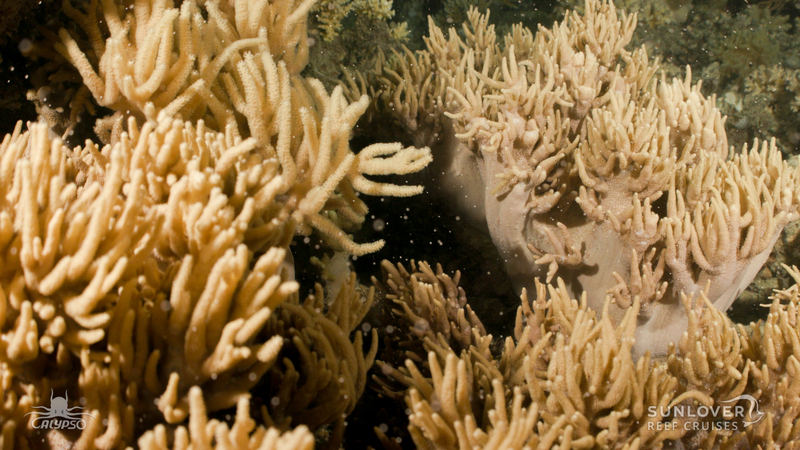 “Tomorrow night will be the main event as Acropora, Montipora and other stony corals will mass spawn, ejecting tiny pink and mauve balls as well as cloud-like white slicks known as “smokers” representing individual male colonies,” Mr Ireland said. Cairns-based marine biologist and educator Gareth Phillips will use Calypso Production's footage as part of a Reef Teach presentation on the Great Barrier Reef. “I focused on the marine creatures during last night's spawning,” Mr Phillips said. “Seeing invertebrates such as worms and shrimps is amazing as their behaviour, as well as the look of the Reef is so different on the night of the spawning. The annual coral spawning, one of nature's greatest events, takes place every year two to six nights after the October / November full moon. At that time there is little movement of water between low and high tides and water temperatures hover around 27-28C. To follow the progress of the Larval Restoration Project and the annual spawning event, follow Citizens of the Great Barrier Reef on Facebook, Instagram and Twitter (@citizensGBR). This Larval Restoration Project is a collaboration between researchers Peter Harrison (SCU), Katie Chartrand (James Cook University) and David Suggett (University of Technology Sydney), the Great Barrier Reef Marine Park Authority, Queensland Parks & Wildlife Service, as well as other key industry partners. This Press Release or Biography or Copyright Free Story is supplied courtesy of Tourism and Events Queensland, please go to: www.queensland.com or www.blog.queensland.com For images, please visit https://visuals.queensland.com/.